Beethoven, L.V., Complete Piano Sonatas, VOl. I, Dover Edition. Sightsinging assignments for he first four weeks come from this book. Mozart, W.A., The Magic Flute, Piano-Vocal Score, G. Schirmer Inc.
Sightsinging assignments from week 5 on are from this score. Click on the above link to use for reference. Monday, April 2: Review of chorales and analyses from the Winter Quarter. Outstanding papers will be returned, and harmony assignments (4) for the Spring will be distributed. T, Apr. 3: Review of diatonic cadential progressions. Part singing of various Bach Chorale settings at sight (selected by TA). W, Apr. 4: Review of eighth-note motion in chorale settings. Be sure to bring the Bach Chorale book to class. SS, prepare PP. 176-178 and the duets on P. 179. KB: P. 25 prepare exercises 3-1 and 3-2 in the keys of C, D, G, A.
M, Apr. 9: Review of altered chords. Variations technique in Mozart and Beethoven. T, Apr. 10: SS drill. SS, prepare canons, P. 184 for performance in class. W, Apr. 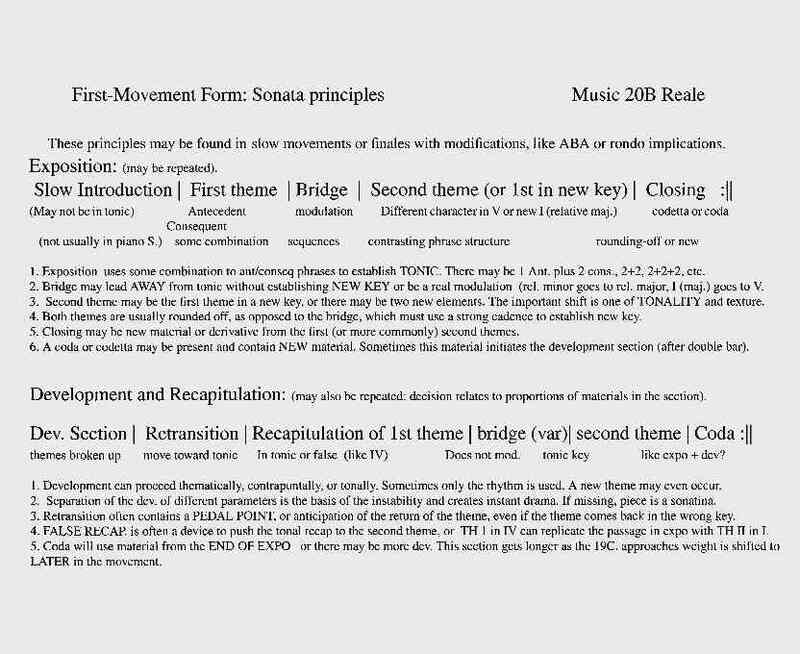 11: Begin expansion of sonata principles. Th, Apr. 12: open skcore. KB prepare 3-8, P. 27. Accelerated students should be able to play 3-9 and 3-10 as well. M, Apr. 16: begin third-related harmonies. Harmony Assignment #1 due (chorale harmonization). T, Apr. 17: drill augmented sixth chords. SS, prepare Propter magnum gloriam, PP. 199-202 for perforamnce in class. Prepare rhythmic exercises, P. 203-204. Drill duets P. 205. W, Apr. 18: Beethoven analysis. KB play exercise 3-38 in g minor, a minor, and c minor. Accelerated students should also prepare exercise 3-37. T, Apr. 24: augmented sixth chords as enharmonic secondary dominants. W, Apr. 25: Further development after recapitulation. TA will arrange small groups to drill keyboard in place of this class. M, Apr. 30: Written Midterm Exam in analysis. There will be a two-hour exam dealing with a movement of a Beethoven Piano Sonata. T, May 1: Midterm in Dictation. The midterm will cover two-part melodic, rhythmic, and harmonic dictations, as well as chord sequences. W, May 2: Musicianship midterm (individual appointments). SS, prepare from Mozart's Magic Flute, PP> 10-15 for performance in class. Accelerated KB students should work on the piano accompaniment and take turns at the piano. M, May 7: the concept of the recapitulation of different parameters at different times. T, May 8: harmonizing melodies. KB do the exercises on P. 43. Accelerated students should also prepare those on P. 44. W, May 9: global vs. local tonal operations I.
Th, May 10: TA's choice (assignment made in previous class from The Magic FLute. M, May 14: global vs. local operations II. T, May 15: continue harmonizing melodies. KB prepare exercises 4-11 and 4-12. Accelerated students should prepare 4-13 and 4-14 as well. W, May 16: Beethoven and counterpoint. Th, May 17: TA's choice (keyboard and SS). M, May 21: Slow movement synthesis. W, May 23: Analysis paper #2 due. Th, May 25: Let's fake and opera. Extended performances of sections of The Magic Flute. M, May 28: Memorial Day. T, May 29: discuss sequences (Brings PP. 52-57). W, May 30: Minuets and Scherzos. Th, May 31: TA's choice for keyboard. M, June 4: Beethoven and Romanticism. T, June 5: TA's choice (keyboard and opera). KB prepare exercises 4-20 and 4-21. W, June 6: Review of chromatic harmony. Th, June7: Review of musicianship skills. Students may seek help from the professor at the office hour, Wednesday 12:00-1:00 PM, by e-mail (p_reale@minotaurz.com), or by phone (dedicated line available until 8PM). In advance of due date, assignments may be faxed for approval. Harmony assignments (4) involve four-part writing in Bach-Chorale style. Analysis papers Nos. 1 and 2 will involve music of Beethoven.